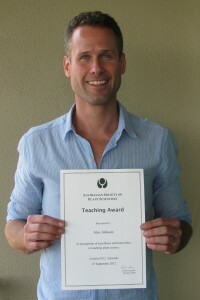 Alex receiving the ASPS Teaching Award in 2012. Photo: Monica Ogierman. Genetic modification of plants is a rapidly growing technology that now extends to numerous plant species and a variety of genetic traits. Since the initial cultivation of 2.8 million hectares of genetically modified (GM) crops in 1996, the amount of land sown to GM crops has increased sharply each year. Approximately 160 million hectares of GM crops, spread out over 29 different countries, were cultivated in 2011. While herbicide and insect tolerance are the dominant GM traits in today’s commercial market, improved abiotic stress tolerance and nutritional enhancement of food staples with essential micronutrients such as iron and provitamin-A are likely to be major applications of GM technology in the near future. Australia is no stranger to genetic modification of plants and in fact was one of the first countries to grow GM crops, approving both GM cotton and carnations in 1996. In 2011, Australia produced 597,000 hectares of cotton, its largest ever crop, of which 99.5% was GM (stacked insect and herbicide tolerance). Australia also grows significant quantities of GM canola in NSW, VIC and WA. In 2011, herbicide-tolerant GM canola accounted for 9.7% of the total canola crop. Despite rapid uptake of GM crops in many countries around the world, genetic modification remains a highly controversial subject that has polarized large portions of society. In March of this year, large-scale protests under the name “Take The Flour Back” were held in Britain in response to GM field trials at Rothamsted Research Laboratory, where wheat had been engineered to ward off aphids through expression of a peppermint pheromone gene. The Rothamsted field trials, and ensuing protests, featured prominently in international media for much of the year with headlines ranging from sensational (‘Trials start of GM wheat that terrifies aphids’) to alarm (‘Fears about new GM wheat that fends off pests with pheromone’) to supportive (‘Peppermint gene in GM wheat could mean no parking for greenfly’). While Australia has not seen large, organized protests comparable to Take The Flour Back, there have been high profile incidents such as the illegal entry of Greenpeace protestors into a CSIRO experimental farm to destroy GM wheat in July 2011. The Greenpeace incident, and resulting legal action against the protestors involved, has frequently appeared in Australian media since 2011. Thanks to the intense media attention that GM plants receive, nearly all university students have at least heard of GM plants and many are eager to learn more. As such, GM plants represent a unique area of plant science that teachers can use to connect with a wide range of students and, in doing so, potentially foster interests in many areas of plant biology. As a lecturer in the School of Botany at The University of Melbourne, I frequently “anchor” plant science lessons within discussion about GM plant projects that are occurring around the world. I have found that students respond particularly well to this teaching model and enjoy applying plant science to real world projects and current events. The Take The Flour Back protests, for example, generated numerous questions from my 2nd year Plant Physiology students this year who wanted to learn more about the GM wheat plants in question. This, in turn, prompted me to significantly expand my lectures on plant hormones to include material on alarm pheromones and chemical signaling pathways in plants. The students quickly grasped the material, performed well on exam questions about it and used the information to form their own opinions about the science under question by the protestors. Two additional GM projects that I have found useful for teaching general plant science include the C4 Rice Project where scientists are attempting to convert rice from C3 to C4 photosynthesis using GM technology, and the Golden Rice Project where researchers have reconstructed the complete Vitamin A biosynthetic pathway in rice grain. I also use examples from GM research taking place in my own lab to produce iron-enriched rice grain (Johnson et al. 2011: PLoS ONE 6, e24476) to teach students about the two different iron uptake strategies (I and II) that have evolved in plants. The GM plant field is growing at a tremendous rate and new examples of GM technology in practice are available each year, providing teachers with a rich source of up-to-date material on which to draw from for their lectures. At the 3rd year level I find that GM projects, such as C4 Rice, or events, such as the Take The Flour Back protests, provide good opportunities for peer-to-peer teaching. Students can be divided up into solution and critic groups and asked to focus on a particular GM technology or event. Questions are then posed to the solution group regarding, for instance, what advantages and/or disadvantages a peppermint pheromone-signaling wheat could provide compared to conventional wheat. The solution group gathers information on that topic outside of the classroom and then gives a short presentation that is evaluated by the critic group. If student numbers are small enough this exercise can involve individual students rather than groups. Requiring each student to also write up a 1-2 page summary of the presentation, which is evaluated by the instructor, ensures that all students play an active role in preparing the presentation and also develops writing skills. The feedback that I have received about these teaching methods from students through Melbourne’s Quality of Teaching (QoT) surveys (ranging from 1 for poor to 5 for excellent) has been extremely positive. Since 2009 the QoT scores for overall rating of the 2nd and 3rd subjects have ranged from 4.1 to 4.6.